If you want to change your IP address to another country, this guide will show you how to choose the right VPN server location. ExpressVPN has thousands of server in dozens of locations around the globe. See a full list of VPN server locations here. when trying to access certain websites and services, contact the ExpressVPN Support Team for immediate assistance. To access content from a specific place, connect to a VPN server location in your desired country. From your app, open the Location Picker. Use the search bar to find your desired country. Double-click on a location to connect to it. Recommended: Recommended locations are based on your geographic location combined with data from connection success rates, customer usage, and speed. All: Browse through ExpressVPN’s server locations around the world, sorted by region (Asia Pacific, Americas, Europe, Middle East and Africa). Recent: Get instant access to your favorite VPN server locations. Using Linux? See instructions for Linux. If you need help selecting the right VPN server location for your needs, please contact the ExpressVPN Support Team for immediate assistance. Use the Smart Location feature in the app to access Facebook, Google, Skype, and VoIP services in Asia and the Middle East. 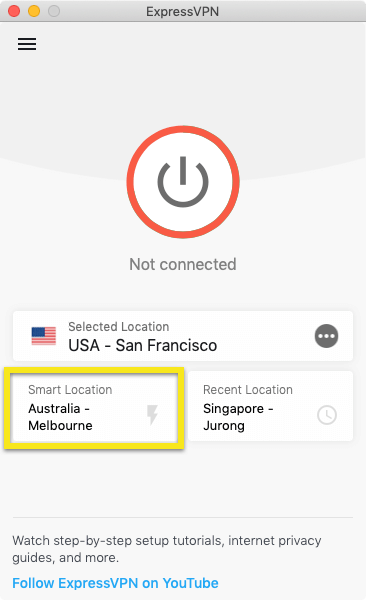 Smart Location automatically picks the fastest VPN location for you based on anonymous metrics like download speed, latency, and distance. Read more about Smart location here. 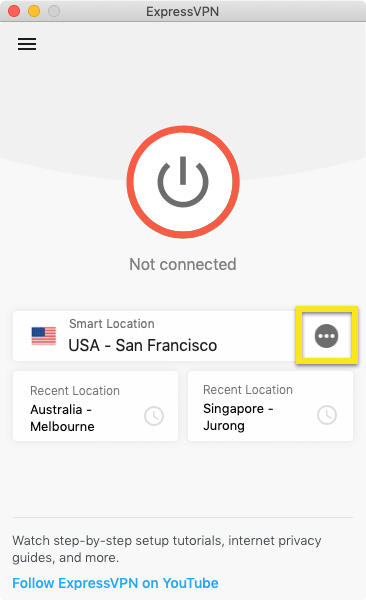 For a secure and private connection, use the app’s Smart Location feature, which automatically selects the fastest VPN server location for you based on anonymous metrics like download speed, latency, and distance. Learn more about Smart Location here. To get the fastest download speeds, connect to an ExpressVPN server location in the country that you wish to download from. If there are multiple ExpressVPN server locations in that country, connect to the one that is closest to you. You can also take the ExpressVPN Speed Test to identify the fastest VPN server location for your needs. Please note that the underlying reasons affecting connection speed are always changing. Contact the ExpressVPN Support Team if you need more help in this area. On the left side of the screen, select Manual Config. On the right side of the screen, select OpenVPN or PPTP & L2TP-IPSec, depending on the VPN protocol you want to use. Scroll down past your ExpressVPN username and password. You will see an expandable list of OpenVPN configuration files and the full list of ExpressVPN servers. Changing your DNS settings helps you access certain websites and online services. You can see your IP address by visiting this page: What is my IP address? If you need more help with picking or connecting to a server location, please contact the ExpressVPN Support Team for immediate assistance.